Title: Photogravimagnetic assists of light sails: a mixed blessing for Breakthrough Starshot? Breakthrough Starshot intends to use lasers to accelerate tiny spacecrafts with huge sails, which they call sailcrafts, towards the Alpha Centauri system. Today’s paper contends with one of many concerns for the sailcraft as it traverses the interstellar medium (ISM) — magnetic fields. 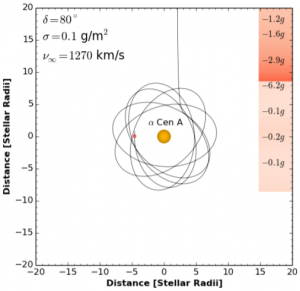 We have previously considered how the gravitational pull and radiation pressure from stars can be used to slow down a sailcraft upon reaching the Alpha Centauri system, enabling the spacecraft the time required to undertake good observations. In this bite, however, we will focus on the addition of a third force, the magnetic force, and how having an electrically-charged sail can dramatically impact a sailcraft’s trajectory. When do magnetic fields become important? First, the team considered the ratios of the three forces in question: gravitational, radiation pressure and magnetic for a sail of 10 square-meters, at a distance of 5 solar radii from the Sun. This means, the mass, radius, luminosity and magnetic field strength are fixed quantities. Figure 2: Ratio of magnetic force to radiation pressure force, as a function of spacecraft velocity and charge of the sailcraft per unit mass. The white lines indicate the ratio of magnetic to gravitational forces on the sailcraft, where the magnetic force dominates above 100 µC/g Figure 1 (top) from paper. The author simulated the values of each force, as a function of sailcraft velocity and charge of the sail per unit mass to determine at which values the magnetic force becomes dominant. Figure 3: Similar to figure 2, but this time we’re dealing with the ratio of the magnetic to gravitational force. 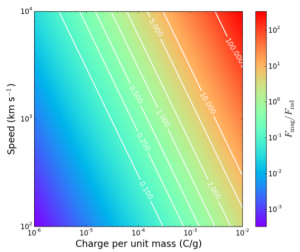 Once again, the magnetic field dominates for charge-to-mass ratios greater than 100 µC/g Figure 1 (bottom) from paper. 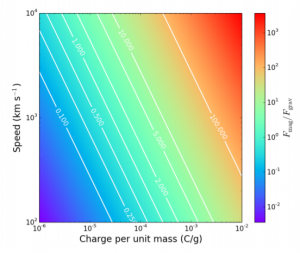 Figure 2 and 3 indicate that as the charge of the sailcraft exceeds 10 µC per gram, the magnetic force becomes comparable to the radiation and gravitational forces. When the charge of the sailcraft exceeds 100 µC per gram, the magnetic force becomes dominant irregardless of the sailcraft’s velocity. Magnetic forces – good or bad? Magnetic forces can be useful for the sailcraft. Building on previous work, the authors repeated an example trajectory of the craft as it approaches a star with the same mass, luminosity and radius as Alpha Centauri A and varied the sailcraft’s charge. 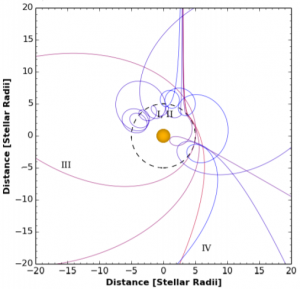 Figure 4: A previous trajectory that would have resulted in the loss of the sailcraft is now possible due to the charged nature of the sails (0.1 mC), meaning the sailcraft can get much closer to Alpha Centauri A. Figure 3 from the paper. One interesting outcome is that the addition of charge to the sailcraft allows it to be placed into a much closer orbit around Alpha Centauri A. Previous simulations suggest a charge-less sailcraft placed this close in would crash into the star. Furthermore, such an orbit could still allow for the sailcraft to be ejected from the system, in principle, onto the next desired trajectory by turning the sail –otherwise known as tacking of the sail. This indicates a charged sailcraft may be useful observing multiple targets. Magnetic forces can, however, be detrimental to the sailcraft’s trajectory. We are not going to achieve the precise trajectory required as we approach Alpha Centauri. Offsets may be small upon entering the system, but the effects are greatly exaggerated with a charged sailcraft as it moves towards its target. 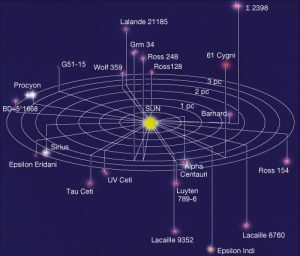 We could miss the target by tens to hundreds of astronomical units (1 astronomical unit = 1 AU = 150 million km). Figure 5: The resulting trajectories for a negatively charged sailcraft, ranging from -10 µC (red) to -1 mC (blue). Figure 5 of the paper. It can get worse. Until now, we’ve assumed the charge of the sailcraft will be positive. If we instead allow it to be -1 mC, so very negative, the sailcraft’s trajectory forms a complicated series of awkward loop-de-loops, making the final trajectory challenging to predict. This is the blue line on Figure 5. Thankfully the situation isn’t as bad for the less negative, red trajectory calculated for a charge of – 10 µC. Once again, are magnetic fields good or bad? Overall, the authors concluded that adding magnetic forces into the equation are a mixed blessing. The best case scenario allows for a charged sailcraft to undergo a much closer approach during a flyby, which can only benefit science. Having said that, if we get the charge wrong and obtain a negative magnetic force, the resulting loop-de-loop orbit makes a final trajectory difficult to predict. Moreover, both of these outcomes assume we get the original trajectory correct, as small deviations from the true course are greatly amplified by a charged sailcraft.